Heavenly blog! : No. 1339: The Trinity of God! Belief in a TriadeGud was a development that one got introduced when Christianity became a state religion by Emperor Constantine in brief. This was a doctrine that was totally unknown to the early Christians and Jews in many ways Muslims also find this learn to be uncomfortable and unbiblical! A few days ago I had a conversation with a Pentecostal, and we entered the Trinity. As good Pentecostal thought he course of the triune God. I answered that as long as I had not read about the Triune God of the Bible, I felt absolutely no obligation to believe in this God. If you move a little beyond what is traditional thinking, it is frequently forgotten to check for the presence of that being said, is consistent with the Bible's teachings. I meet this problem too when I testify against the doctrine of endless torment. Belief in an endless agony sits so deep that it is not at all interesting to go into the scriptures that disproves this doctrine. On trehundretallet was controversy about the triune God fierce. 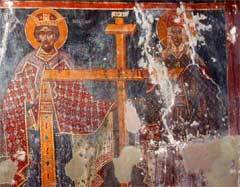 Christian flogged each other in public for the three divine persons' guilt, often as the blood flowed. Eventually overcame the Trinitarian doctrine that Christians today profess. And you know the why in earlier times was death to go against church teachings. In 1553 argued Spaniard Michael Server with great spiritual strength against the church Trinitarian doctrine. Vainly church to get him to go back on what he had written. It went as it had to go at the time. On reformer Calvin's initiative, he was burned at the stake. I write this to show that the controversy about the triune God is not new. If I ask pastors, preachers or ordinary Christians for a report about the triune God, I can get quite different answers. I am therefore obliged to stick to the official version. The teachings found in the church confessional. We know that ordained priests and bishops are obliged to teach in accordance with his confession. I will cite some of these writings, and I have every reason to ask: Is such a doctrine in the Bible? In The Athanasian Creed (from about 500's) says. "Whoever will be saved, before all things stick to the catholic faith. Whoever does not keep it whole and undefiled will without doubt perish eternally. device, as we neither confusing the persons or dividing the substance. For one person of the Father, another of the Holy Spirit. But Father and the Son and the Holy Spirit deity is one, the glory equal, the majesty is coeternal. Uncreated, the Father uncreated, the Son uncreated, the Holy Spirit. Incomprehensible, Father incomprehensible, the Son incomprehensible, and the Holy Spirit. Eternal Father, eternal, the Son eternal, the Holy Spirit. And yet they are not three eternals but one eternal, as also not three uncreated nor three infinites, but one uncreated, and one incomprehensible. " "In the same way the Father is almighty, the Son almighty, and the Holy Ghost almighty, and yet there are not three almighty, but one almighty. For as the Christian truth compels us to acknowledge each person by himself to be God and Lord, so we are forbidden by the catholic religion to say that there are three Gods or Lords. And in this Trinity none is before or after, nothing greater or less. But all three persons are coeternal and coequal, so that in all things, as has been stated above, the Trinity in the unit, and the unit in Trinity. " After quoting from the Athanasian creed, I must be allowed to say that it is not difficult to discover that it is not the Bible which is the inspiration for this publication. Instead of throwing the entire manuscript on a rubbish dump, exalts church this a confessional. I think Christian leaders must decide. Either get the belief in one God, as the Bible teaches us, or so they get belief in three gods. To say that they believe in three gods while being a god, is unbiblical, pointless and silly. Illustrated Norwegian Bible Lexicon is written by some of the country's foremost Bible Connoisseurs. Lexicon defends hot The Athanasian Creed. I quote: "The word Trinity states that God is threefold, while one. This word does not occur in the Bible, but the concept is strong biblical substantiated. The term's first in Theofilus of Alexandria, but it is the church father Tertullian who brought it inside. "Here Admittedly it is thus that there were people who lived long after the apostles who brought this teaching to breakthrough. Now referring albeit INB a lot of scriptures to prove the correctness of this doctrine. Unfortunately it turns out that the scholars use their knowledge of the Bible to coarse manipulation. Therefore it is important to ask the question: The passages referred to, proving that God is triune, or that "the Father is God, the Son is God, the Holy Spirit is God, and yet there are not three Gods, but one God ? "I am of the opinion, having quoted from these writings that the Triune God is a product of the imagination of a god, created by an apostate church long after the apostles. In confession confession Augustana (written by Melanchthon, approved by Martin Luther) appears the phrase "true God and true man," up. Therefore, we often hear that it is preached that it was God himself who came into the world to atone for our sins. This despite the fact that the entire New Testament is a long testimony that God sent his son into the world to atone for our sins. In the Bible we read that Jesus prayed to God, Jesus sits at the Father's right hand, God raised Jesus from the dead, a voice from heaven spoke, "This is my son, the beloved." Etc. These biblical testimony is meaningless if Jesus was God. When I write that Christians, especially conservative Christians, engaged in gross manipulation to get the doctrine of the triune God to conform to the Bible, I will show some examples. Thoralf Gilbrant is editor of the Norwegian Study Bible from 1988. Other employees are famous people who Sigurd Grindheim, Norvald Yri, Arthur Berg and Carl Fr. Wisløff. To emphasize that the Trinity is found everywhere in the Bible, they have inserted a symbol Outside the the verse that they believe clarifies the doctrine of a triune God. I went through the 4 evangelia, and concluded that this symbol is used ca. 80 times. I look at the first 6 places in Matthew where this symbol is used. Matt 1,2. "Abraham begat Isaac, Isaac had Jacob. Jacob Judah and his brothers. 1.20 to 21. "But while he thought on these things, behold, it showed an angel of the Lord appeared to him in a dream, saying, Joseph, son of David! Fear not to take Mary your wife into your home. For that which is conceived in her is of the Holy Spirit. She will bear a son and you shall call his name Jesus, for he shall save his people from their sins. "2:23:" When he got there, he settled in a town called Nazareth, so that it would be fulfilled which was spoken through the prophets, he shall be called a Nazarene. "3.16 to 17. When Jesus was baptized, went up straightway out of the water. And lo, the heavens were opened unto him, and he saw the Spirit of God descending like a dove and coming upon him. And behold, there was a voice from heaven: This is my beloved Son. In whom I am well pleased. " This is what I believe is manipulation. How they can use these verses as proof that God is triune, is a mystery to me. Here not the publishers of Norwegian Study Bible been honest in their dealings with the biblical texts. Moreover, the symbol is used, an open eye which is surrounded by a triangle. This symbol is pagan and goes by the name "eye of providence." The symbol is used in the occult organization Illuminate and other more or less occult Masonic lodges. It is not expected that a pagan / occult symbol pops up on every page when you set out to read the Word of God. Editor Odd Sverre Hove in Day magazine is very fond of the triune God, and often refers to the god. Once he would defend this god, he used Matt 3.15 to 16 to prove that god's existence. Here it must be our one way or another that has turned Hove with blindness. These verses refute the Jesus is true God. Jesus walked on earth, God spoke from heaven and cried met a proud heart. "This is my son, in whom I am well pleased." This is kindergarten logic. When God reviewing Jesus as his son, Jesus can even impossible to God. In Johs. 1 we read, "In the beginning was the Word, and the Word was with God, and the Word was God. He was in the beginning with God. All things were made by him; and without him was not any thing made that was made. I assume that the word here referring to Jesus, and I got the problem. How could Jesus be with God while he was God? The solution I found in 2 Mos. 4 and 7. It says: "And he (Aaron) shall speak to the people for you; he shall be your mouth, and you shall be to God for him. "Chapter 7:" Behold, I have made you God to Pharaoh, and Aaron thy brother shall be thy prophet. Here we see that Moses was called God for Aaron and God of Moses. Obviously this does not mean that Moses was God Almighty. Aaron and Pharaoh would abide by the word of Moses, for Moses spoke the Word of God to them. Likewise, we will abide by the words of Jesus, for Jesus spoke God's Word to us. It might be interesting to take a closer look at the power relationship between God and Jesus. God stands over Jesus in power, comes out clearly in Jesus' own words: "Father is greater than I am," and Paul description of God as the head of Christ. A description of GT explains in a brilliant way power relationship between God and Jesus. After Joseph had Pharaoh dream, put Pharaoh Joseph to rule throughout Egypt. It says: "You shall be responsible for my house and all my people shall abide by your word; only in the throne will I be greater than you .------- Look, I appreciate you all over the land of Egypt. "(1 Mos. 41, 38-46 Les preferably all verses.) So it is between God and Jesus. Because of Jesus' obedience to God, God has given all authority in heaven and on earth to Jesus as it says: "I have been given all authority in heaven and on earth." Pharaoh trusted Joseph, and Joseph ruled in accordance with Pharaoh will and therefore it was never inconsistencies between Pharaoh and Joseph. So also with God and Jesus. God trusts in Jesus, and Jesus knows how to govern in accordance with his father. But of course, the one that gives power is greater than he who gets power. Johs. 1 shows that Jesus was with the creation. This agrees well with Proverbs 8. It says: "The Lord created me as his first work, before his other deeds of old .--- When abyss was yet to, I was born, when there was still no fountains filled with water .---- when he built the heavens, I was there, when he beat arch over the abyss. Then he fastened clouds above, when he set boundaries for the sea, so the water does not go beyond his command, when he laid the foundations then I was foreman at him, and I was his desire, day after day, I was playing always before him; ---- "It is clear that I am grateful that I do not believe in a triune God. The understanding of this beautiful portrayal would then passed me by. Jesus said on one occasion: "Except ye be converted, and become as little children, ye shall in no case enter into the kingdom of heaven." I myself have 4 children. If I in 1995 had said to my 8-year-old daughter that God is the father of Jesus, when she realized this. If I further said that when God is the father of Jesus, then Jesus himself being God, she would also though it. I told her that I am the son of Alfred Marøy, she believed me. Had I said that I am the son of Alfred Marøy, while I myself have him, she would rightly wonder whether I had lost my mind. Small children understand these simple truisms, while faith in the church confessional prevents even professors of theology to understand anything. I am reminded of the fairy tale "The Emperor's New Clothes." Theologians, priests and preachers speak with pride and solemnity of the Triune God, this beautiful mystery that God is threefold while one; that Jesus is true God and true man; that Christianity's Trinitarian doctrine is exalted above all other religions, etc. They live in a delusion, and young children are able to reveal them. They know that it is not possible for Jesus to be both God and God's son. Trinity tells us that the Holy Spirit is a divine person with God and Jesus make up one God. On another occasion, I will argue why I believe this is contrary to the Bible's message and all logical thinking. Now there are enough people who would argue that Marøy is an insignificant, and therefore need not worry so much about what he writes. So might be that I am insignificant, I no longer have any great ambitions. But one thing I know: It's God of the Bible, heaven and earth who has called me to testify against the doctrine of the triune God, and it is not too hard to understand purpose. By retaining the doctrine of the triune God, violate one the first commandment that says "Thou shalt have no other gods before me." I feel like I have learned so much of God's love, care and grace that I'm looking forward to that one day I will meet God and his son Jesus Christ. But if I get there, I must hold on to the truths revealed in the Bible's message. Therefore, woe is me if I ever come to defend the doctrine of the triune God or the doctrine of an endless torment for the disbelievers. I know the truth of these matters, and it will be completely different motives than love of the truth that will get me to change its position.